Over the past few decades, man has made all possible attempts to conquer the rivers by blocking them off with long embankments, dams, barrages, channels, crossroads, short-length bridges, and physical structures, all leading to deteriorating river conditions. People, unaware of the dire consequences, have treated rivers as a means of dumping all kinds of garbage. Biba Jasmine and Annelieke Laninga feel that River Harnandi (Hindon) is no exception to these atrocities! 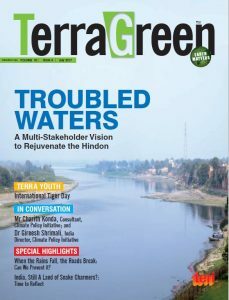 They highlight that given the gravity of the situation, various approaches towards rejuvenating the Hindon River are adopting ecological measures (particularly, the ‘Hindon Yatra’ exhibition and symposium series) that aim to effectively stall deterioration and reduce pollution. With the aim to involve stakeholders from different backgrounds in reviving the Hindon river basin, a ‘Hindon Yatra’ exhibition and symposium series was initiated by the 2030 WRG and its partners. The aim was to endorse a common vision and demonstrate good practices to inspire and motivate actors from all sectors to prepare a basin-wide action plan with positive action towards collectively achieving a healthy river basin.